Helping you keep up with us, and the industry. In this video, Tapemark Engineer Tim Brown discusses our converting process while the process is active. He also describes our camera's and data collection, which helps us be as accurate as possible and provide our customers with the best information. Watch the video to see our active converting process and learn more. 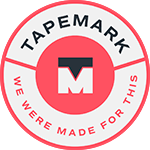 [Transcript] "Hi, Tim Brown from the Tapemark engineering department, brought you into a converting process today to share some things that we're pretty proud of. What you see on my right hand side is all of the product coming out that's already been visually inspected from what's on the left. These high resolution cameras are actually used to actually produce data, and that data is driven to meet your CQA's on your part. Now the cool thing about that is once we set up these recipes, these recipes are used as data to go into spreadsheets. We can put them into a stat graphic for you, any type of report. We've probably had to do it before."